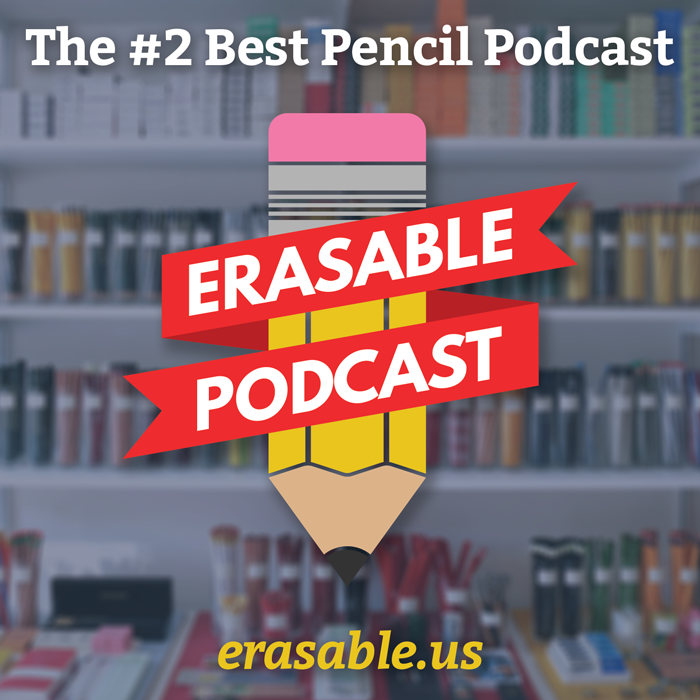 I get email: A good quality, Blackwing-like eraser topper? Anyhow, this came in last week from someone who stumbled across my site after looking for information about Blackwings. Do you know of any Blackwing-like eraser tops that you can buy as separate items and attach to a regular pencil? I’ve googled but haven’t found anything for sale. The flat, angular shape of the Blackwing eraser is fantastic. Unfortunately, the pencils are too soft for my taste. I like F and #3 pencils and higher, and they come either with lousy erasers or none at all. Block erasers are too wide and quickly lose any sharp angle they started with. The eraser tops you can buy at CVS or any place like that and stick over the top of the pencil are of inferior material, and the base splits fairly soon and they become useless. I feel for you, dear reader. I don’t use pencil toppers myself — I don’t like the extra weight they add to my pencil. On the other end of the spectrum, (and I know I’ll get some flack from some pencil purists here) I’m usually not a fan of the pencils that aren’t topped with anything, just capped. I think they feel too light and, even if I know they’re of great quality, cheap. I’m typically a fan with a pencil with eraser attached. A Palomino pencil with the ferrule of a Palomino Blackwing. Photo from The Blackwing Pages. Click through to the original post. To be honest, I haven’t really seen any good quality pencil toppers around lately. Either they’re all cutesy little monster toppers, or some kind of novelty. Or, of course, you have your standard little PaperMate arrowhead erasers, but you’re absolutely right. They are inferior. When I used to blog at PencilsThings.com (back when they had a blog), I got a really handy little clear plastic topper that doubled as a point protector, and had a very fair-quality eraser on the end of it. After poring over the site as it is now, I don’t see anything even close to that. I’m sorry I don’t have a good answer for you! Other readers, do you have a good be-erasered pencil topper you use that fits the needs of the message above? Let me know in the comments! 1 Aaand, just like that, I violated one of my big rules of blogging: No talking about being sorry about not blogging! I’ve never seen a pencil eraser like this one. Interesting. Why not just buy a set of each and use them together? It’s not like pencils are prohibitively expensive or anything. That’s true, Alonzo. Though I bet she’d want something unified into one utensil, for ease of transport (though admittedly two pencils isn’t exactly a travel burden). Say Andy, I don’t know what you mean when you call PaperMate’s Arrowhead erasers “little”, nor am I quite sure you intended to imply they are “inferior”. Having purchased and used cheap dollar store Chinese knockoffs, I assure you PaperMate’s Arrowheads have a much thicker (perhaps too a slightly longer) cylindrical well which keeps the eraser in place as it is being used, even vigorously. The problem with the ersatz arrowhead erasers is that they are noticeably smaller and lighter, and the wall is so thin they tear under torque and won’t stay on the pencil end entirely defeating their purpose. Also, the knockoffs I used were decidedly substandard in erasing performance–PaperMate’s Arrowheads are very decent performers and have garnered an overall five star rating on Amazon from nearly a hundred happy consumers. Possibly Pentel’s white penciltoppers are better yet (I want to try them) but there is nothing seriously wrong with the PaperMate product. Finally, while I am convinced the Blackwing’s removeable and replaceable thin flat rectangle is the ideal form for an eraser, when it comes to erasing cleanly without smearing the Blackwing rubber is only a so-so performer.